Despite being a developer of a tool that runs on Firecloud all the time, I have never actually used Firecloud (or Firehose), so please do not underestimate my ignorance for the following. . .
We're planning an enormous Mutect validation based on the MC3 workspace: nci-gsaksena-bi-org/MC3_mutation_validator. In this workspace they called over 10,000 pairs with several tools and then validated each call with RNA seq and wgs to produce an enormous maf. For our validation we want to run Mutect2 on some of these pairs and compare to this enormous validated maf using our own validation wdl. For that we need the bams for the pairs and the maf. QUESTION #1: When I try to navigate to the enormous validation maf following the link in Firecloud to the google bucket of cromwell outputs I get the error "The account for bucket "fc-e5920d62-ed56-47ed-8a61-bf1cac042c69" has been disabled." How do I download this file? QUESTION #2: It would be easiest for us to do this analysis outside of Firecloud with our own cromwell setup. Is it possible to get the google bucket paths to the bams for these pairs and then run cromwell pointing to these buckets, or can they only be accessed via Firecloud. That is, from the workspace I can find the sample name AC-1190-TCGA-01D or whatever, but can I translate that to gs://tcga-bucket/AC-1190-TCGA-01D.bam and then use that path, circumventing Firecloud? To answer your first question, it sounds like you may be having an issue with being logged into multiple Google accounts. If you are logged into multiple google accounts in your Chrome browser, for example, you may use one account to access FireCloud. I'm assuming this account will have all the permissions needed to access the workspace you mentioned, and permission to access the data bucket. When you click on the data bucket to access it, Chrome sometimes switches to one of your other google accounts, which does not have permission to view the bucket, resulting in this error. The temporary workaround for this is to use incognito windows. Open up an incognito Chrome window, log in to FireCloud with the correct account, and you should be able to click the link and view the data bucket without Chrome switching you to another account. 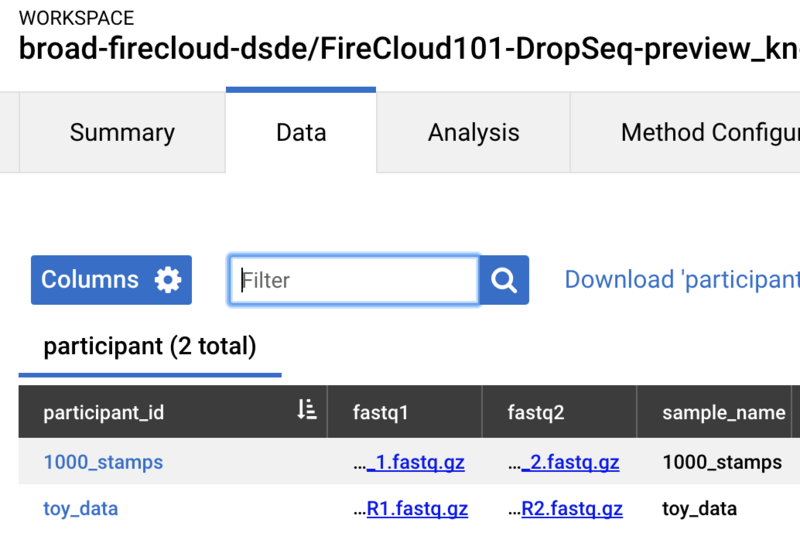 For your second question, I do know that it is a bit more complicated to set up access for an outside Cromwell to use data in a google bucket generated by FireCloud. You will need to set up the right credentials so that your Cromwell can access the bucket through your account. However, assuming that the Cromwell you have is already set up to work (which is what it sounds like, given your situation), simply finding the gs:// URL is simple. If you click on the hyperlinked text, it will give you a dialog with more information, including a sample command highlighted in dark gray. This command will allow you to copy the file to a destination of your choice, but it also has the full gs:// URL in an easily copy-pasted format. I want to add that at the bottom of the dialog, it will give you the estimated cost to download the file from the Google bucket. Downloading data from Google's cloud storage buckets is expensive, so I'd recommend to avoid downloading them if you can. It's much more efficient to be able to reference the bucket location and run your work on that. Sorry for not acknowledging your response earlier. I didn't have email notifications turned on and assumed that I did. For #1 it eventually turned out that a billing account that been switched. For #2 I understand how to access a Firecloud bucket, but I was specifically wondering about TCGA bams, which I imagine might be more protected. However, this is a moot point now because in the last month I have learned to use Firecloud and come to like it a lot. Not a problem! We are glad that you've come to like using FireCloud.